I just got back from my local music radio show on internet only WBKM. I worked all day, caught a quick nap, walked downtown and created the show. Fortunately for me, there is so much great music in this town, it’s not that hard to do. From our small city to the great big world, these are the Sounds of Burlington. Despite a super warm December, winter has pretty much set in. Let’s begin with some local songs about the cold time of year. Such great cold imagery from the Texas band who spent many winters playing lovely music for us. Thanks Cush!! Stylus is all about Orion who appears in the sky in winter. That sled that you got for Christmas, but couldn’t use at the time, well now there is lots of snow and cold, so have at it. Nice song from Dave. It’s a bit of a mellow evening in Burlington, so let’s go with that vibe for a bit. Great song from Hana about living in the space between two lives. Great song from Cricket who are playing shows all over. I love all the local references in Syd. Super strong song from Maryse Smith. Let’s keep the mellow but strong vibe going for a bit. Such a great song from Kat Wright and the band. Hopefully they will have new music soon. Nice cover done by a killer guitar player and a driving force behind Dark Side of the Mountain, who are playing in Stowe soon. If you like the Josh song check out his band Sammich. Great song from Jeremy Gilchrist. Tomorrow night at Radio Bean Barbacoa will be the backing band for a bunch of local artists playing David Bowie songs. I don’t know if anyone in this next band will be part of it, but they did release this song this week. Nice cover song from Ho. I thought it would be fun to bookend that set with the covers and stick a couple of new and old classics in between. This next set is for the optimists of the world. Francis is from Scotland but he lived in Vermont for a while around the time he released the album Man. He played Mystic and other song from the album often at Club Metronome. I just love the sentiment from Binger, and the rock. Great words from Bill and Bernie. OK, let’s take a swing through some ’90’s classics. Absolute classic from Wail. Great rocker from Envy. Finder is such a fun song with a great riff. I just love the Hover song. This next song is one that has always spoken to me. This is one of the coolest bands to ever play JP’s. 25.) Chester Allen – The World Famous Hanglows. I hope you enjoyed checking out the music of our town. Let’s do it again next week. I’ll say goodbye with the next song on Red Flannel Hash. I just got back from my local music radio show on internet only WBKM. I highlighted a couple of the artists who make our town great, one who just left and one who is still playing for us. I also highlighted one of the great institutions that have brought music to our town for decades. From our small city to the great big world, these are the Sounds Of Burlington. Tonight I want to highlight a couple of cool musicians who have brought so much to our town. I’ll get to that in a moment but first something cool happened earlier this week. I finally looked up in the sky and saw Orion. Despite the 50 degree temperatures today, you know winter is coming when Orion appears. This is my favorite local song about Orion. Justus Gaston plays guitar both in Sad Turtle and Wave. He’s a pretty cool guy and also plays drums in another cool band. I’ll get to that in a moment. 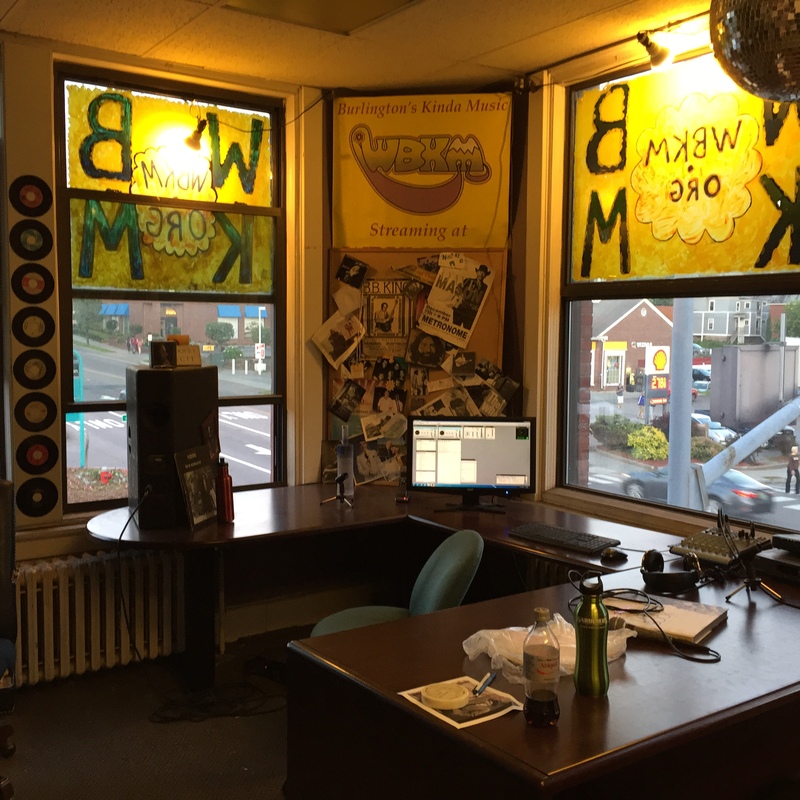 For as long as I have been seeing and listening to music in town there has been a radio station from UVM that has taught people how to be DJ’s and has brought lots of underground music to any who want to listen. The have also done a stunning job of supporting local music for decades. Their local music show is called WRUV Exposure and happens every Wednesday. A few days ago the host, Dom the Barber, sent me a message that one of my favorite local bands would be playing live in the studio. He invited me to join them for the performance and to chat on the air in between songs. That happened yesterday, December 9th from 6:30-8pm. Dom sent me an mp3 of the show and I’m going to play the whole thing for you now. This band features Justus Gaston on drums and this is The Mountain Says No. Hey guys, Tim here back in the studio. I think I played that whole thing for a few reasons. That is exactly what WRUV sounds like and has always sounded like. I really wanted to thank Justus for all of his contributions to our music scene, and to thanks Andrew Frappier, Ben Maddox, and Jedd Kettler for the same reason. I did it because that was a band playing a full live set that happened in town yesterday so is the sound of Burlington by definition. I did it mostly because I had it as one file and I really wanted to play both new Mountain songs on my show. Up next, I want to thank another person who has put a ton of music into our town. His name is Justin Gonyea and he has promoted a ton of shows at 242 Main and has played in a few bands. He’s off to Seattle and we wish him the best of luck. I’ll play a bunch of his music as a thank you for all he has added. But, before that, let’s play the second song on Red Flannel Hash, the album I am playing all the way through, song for song, week after week. Justin played in Doom, Skull and did the Crime Scene thing with Bobby Hackney Jr.., Matthew Kimball and a few others just before leaving town. Thank you Justin!!!! Well, I hope you enjoyed checking out the music of our town, let’s do it again next week, shall we? I just got back from my local music radio show on internet only WBKM.org. It had a bit of a regal feel and highlighted a lot of the music from last week and this coming weekend. It was also seasonally appropriate, even if the weather wasn’t. From our small city to the great big world, these are the Sounds Of Burlington. It’s been a super warm, maybe in the 70’s, day and it’s warm this evening. A lot of people are out and about and enjoying the night. Today is the 5th of November, the day Guy Fawkes tried to blow up Parliament. As we have evolved over the years, there is less of a need for such drastic action. In fact, all we have to do is elect reasonable and compassionate and smart people, and we could have a great government. Maybe one day. Tonight, let’s begin with Burlington itself. It was founded in 1865 and was a major lumber mill port that brought wood from Quebec to the eastern US. Early on, it was called the Queen City of New England. Let’s begin with some Burlington music about queens. Some of the regal music from Burlington. It’s interesting to see how we have evolved. We began by needing a strong leader, and have moved to a system were we can govern ourselves more and more. If we are cool about it, we have a lot of potential. OK, last Friday I caught a ton of cool music. I started with this band, although the set I caught was them covering the Elvis Costello album Blood and Chocolate. This is the next song from No Need To Beg. I began the night at The Skinny Pancake to see Phil’s first set, then hustled to Light Club Lamp Shop to catch Maryse Smith‘s stunning set. Arc Iris followed and were amazing as always. I hustled over to Finnegan’s and missed Mountain, but caught some of Wave’s wonderful set, including that fun song. There’s a fun show at Finnegan’s tomorrow with some of the guys in Rough Francis playing as Aspero Siacos, and a couple of other cool bands, like this one. It will be interesting to see what AS sound like, but other two will certainly be killer. Saturday is the day Radio Bean has it’s birthday. As always they will have bands play from 8am to 2am, with about 15 minutes per band. This next band always kick it off. I’m psyched to see all of those bands play. I’m psyched to see these next ones too. I’m sorry I missed Binger playing the Scooby Doo show last weekend but am psyched to catch up with them this Saturday. All of those bands rocked, but there will be a lot of music played that day. Here are some of the mellower bands that will play. I’m not sure if Linda is playing kids songs or older people’s songs or both, but it will be fun to find out. I may have to catch Eric for the first time. Kat and Brett always sound nice. Sweet song from Michael. This next song is by Caroline Marie, who has played every Bean Birthday. I’m thoroughly excited to see Swale already, is it Saturday yet?. Kat and the band are always great. I finally got the see Emily play joke in Barret. I bet he plays that one, what with the Radio Bean references and all. Killer song from Caroline. Songs 13 to 28 are just a tiny hint of what that day will sound like. Is it Saturday yet??? OK, let’s end where we began, with another song from the Queen herself, then I will say goodbye.